17 Jesus replied, “You are blessed, Simon son of John,  because my Father in heaven has revealed this to you. You did not learn this from any human being. 18 Now I say to you that you are Peter,  and upon this rock I will build my church, and all the powers of hell  will not conquer it. 19 And I will give you the keys of the Kingdom of Heaven. Whatever you lock on earth will be locked in heaven, and whatever you open on earth will be opened in heaven.” 20 Then he sternly warned them not to tell anyone that he was the Messiah. Greek, Simon son of Jonah; see John 1:42; 21:15-17. Peter means “stone” or “rock”. From the text it is uncertain what time of day the story is set at. I have set the time as mid morning. The sun rising on the left (east) of this scene provides the natural light. 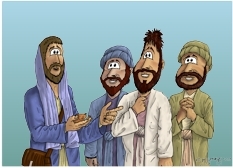 From left to right: Jesus, in blue outer robe, talking to Andrew, Simon/Peter, Bartholomew/Nathaniel. Version 01 (Previous page) has a rock background. Version 02 (This page) has a plain, teal coloured background. This scene has the same characters as in the previous one (Matthew 16 – Peter’s confession – Scene 02 – Who am I?). The primary difference being the pebble that Jesus is holding in his hand, which he is using to illustrate his point about Peter (which means “rock”, in Greek ) & the bedrock (”Petros”, bedrock, which we see in the background) on which Jesus will build his church. Difference between Petros & Petra. Verse 18 reads, “Now I say to you that you are Peter (which means ‘rock’), and upon this rock I will build my church, and all the powers of hell will not conquer it.” It is interesting to note the difference between the word for Peter (Greek Petros) & the word “rock” (Greek Petra) in this verse. The name Peter means a rock or stone, but the reference to rock (Petra) refers to a rocky ledge, a cliff, or bedrock. “The ancient church fathers gave various interpretations of this statement. Some said that the rock on which the church was founded was Peter. Others insisted that the name Peter (petros, which means “little stone”) could hardly be identified as a foundation rock. Other fathers have argued that the church is founded on Peter’s confession: it is the faith in Christ which Peter professed which is the church’s foundation. Still others have seen this as a reference to Christ Himself. Jesus the Christ, the Son of God, is the foundation. When relating the parable of the wise & foolish builders (see Matthew 7:24-27) Jesus referred to the wise man building on solid rock (verse 24) & bedrock (verse 25). In both these cases the word we translate is the Greek word petra. a rock [Gk. Petra] that makes them fall. a “rock” that makes them fall. common stone (in natural state), stone (as material), of tablets, marble, hewn stones, precious stones, stones of fire, stones containing metal (ore), tool for work or weapon, weight, etc. It can also refer to strength, firmness, solidity, & metaphorically, it can mean petrified with terror, perverse, hard hearted. The word for “rock” is the Hebrew word tsuwr. That word refers to rock, cliff, rocky wall, block of stone, &/or boulder. Notice that Isaiah writes “HE” will be a stone that makes people stumble, a rock that makes them fall. Commentators are generally agreed that the “HE” is referring to Jesus.